April | 2009 | . . Life of Pi . .
1) The rules havn’t changed…unlike technology, that changes every 18 months, you’d upgrade your PC or risk not being able to support MSFT’s new blue screen, the rules to dating have not changed at all. there’s still the 2 day rule for calling, the weekday date and you level up to the weeknight date. then if you’re REALLY special, you get a weekend date. There’s still the ‘my friend likes you’ the ‘what are you drinking’ and the ‘hi my name is…’ but now, instead of giving phone numbers, everyone’s exchanging blackberry pin’s. 2) When you date, you’re searching. 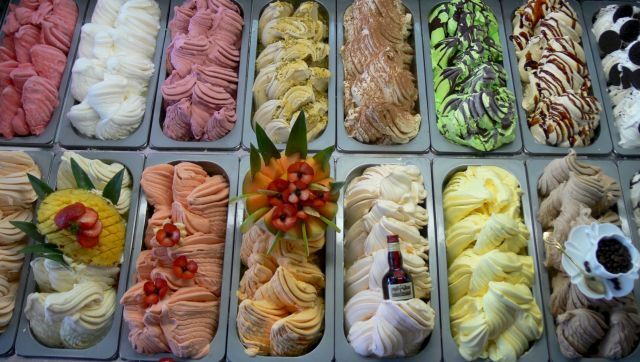 It’s like 510 Flavors of Gelato. You walk in, do you pick the wasabi green ginger ice cream right away? No. You ask for a taste and they give you one of those little tiny plastic spoons with a chunk of ice cream. You taste it and you decide if you like it or not. I decide that I will pass on wasabi green ginger ice cream today. Can I try some lime lemon sorbet? And so on, until you have the flavor that you like and then you say “Give me more of that. I like that.” So now you walk out of the Gelato place, happy as a clam in high tide with the ice cream of your choice. You’re confident that the choice you made is the right one because you’ve tried the rest, now you’re with the best. Isn’t dating the same? You go on one or two dates, figure out that the guy who you thought was soooOOOooo funny was really just drunk that day or that the girl who you thought was really deep because you philosophised about the meaning of life on the first date just turned out to be really not-smart (PC for dumb) and was really just asking alot of questions for real and not just rhetorically. 5) That if you don’t look, they’ll come along in their own time. When you find someone who you’ll willingly give up sleep for, want to hang out with all the time and constantly has you checking your blackberry to see if they’d bbm’d you while you were brushing your teeth…all without having to try to get their attention, that’s the way it should be. The law of natural attraction, instead of forced interest or faking yourself so the other person will notice you. Yesterday was my last day at work. I was laid off 7 working days ago when my boss asked me to step into his office and proceeded to tell me all the reasons how it wasn’t me, it was him…and how maybe there would be a possibility for us to work together again in the future, that right now it was just bad timing and that he just couldn’t afford to pay me anymore (wow, that sounded like how I’ve ended relationships). Of course, just as my ex’s do when I tell them that, I freaked out a bit. I cried. I fetal’d up and rocked back and forth for an hour or so…in the dark. It was kind of sadly funny, because the day before, I’d hurt my foot running around the seawall. Something called Plantar Fasciitis (wiki: Plantar fasciitis is a syndrome of heel pain due to inflammation of the thick ligament of the base of the foot. A tight, inflamed plantar fascia can cause pain when walking or running, and lead to the formation of a heel spur. ) And that morning, it was nice out but it’d started raining heavily during the day. So here I was, freshly laid off, limping home in the rain with no umbrella. I could almost hear the violins, serenading my tragedy. That was it though. When I’d gotten home from the walk, I’d let all my anger, sadness and negativity out already. It’d washed away with the rain dripping down my temples. I let myself go for a bit, I let myself wander and lose all hope, to be really sad, to be really angry and be the victim for a bit. I told myself I was screwed, I told myself it was the end, that I was done. It felt good. It felt like a relief to be a victim, to know that there was nothing you could do and that you just had to accept what was. 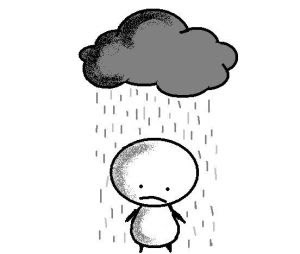 But once the feeling subsided, it never came back. It’s funny how that works. When my ex and I broke up, I’d run into some random things and feelings welled up inside of me. Memories flooded my mind and I’d get emotional about it. But the next time I’d run into the random thing, the feelings never came back. It was a one time thing. I think from that, I’d learned that if you hold things in, push it to the back of your head, it never goes away. But if you let it take you over and control you for a powerful short time, it will leave you and never come back. I made a few calls. I applied at a few places. I broke it down to one small step at a time, one doable task at a time, leaving my doomsday thoughts out of it, but just concentrating on one step at a time. Today I had my final interview with a company and throughout this week, I’d had several. I have 3 offer letters in front of me, all equally attractive. I had a CEO come into the 2nd interview and try to close me on why I should work for his company. I had a Director challenge me in foosball on my way out because he wanted to show me how great of a culture his company had. This last 7 days have been amazingly busy but well worthwhile. Now, I’ll have a week or so off of work (a mini vacation!! woo!) and my pick of futures to walk towards. 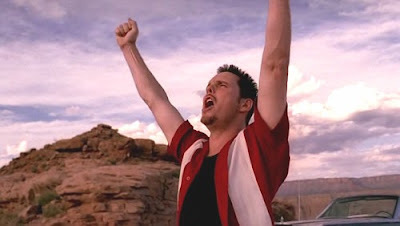 In the words of Johnny Drama, VICTORRRYYYY!!! And like Drama, I couldn’t have done it without my friends. They kept me up, they kept me motivated and they let me know that I really wasn’t that screwed. 😉 Thank you.